Like the Common Merganser, the Red-breasted Merganser is not common in Tennessee during any part of the year. On deeper lakes and rivers, it is an uncommon migrant, and rare winter resident across the state. The distribution and ecology of the Red-breasted Merganser are similar to the Common Merganser but, in contrast, it occurs more frequently in salt water and estuaries, and typically nests on the ground. It too is a fish-eating diving duck, and has a long thin bill with toothy projections used to hold slippery fish. The Red-breasted Merganser is a bird of the tundra and boreal forest zones, inhabiting coastal bays and large water bodies or rivers from Alaska, across Canada southward to northern New England. It is also found in Greenland, Iceland, and across northern Eurasia. In winter the Red-breasted Merganser is primarily found along the Pacific, Atlantic, and Gulf coasts to Mexico, and also in southern Europe and China. Description: The male is boldly patterned with an iridescent dark green head with a shaggy double crest. He has a white neck and brown chest, gray and white sides, and a thin bright orange bill. The female is dull gray on the body, with an orange-brown head with a shaggy crest, and a thin orange bill. Male and female show a large white-wing patch in flight. Common Merganser males have no apparent crest, and a white chest and sides. Females also have no apparent crest, and a darker brown head. Winter loons can look similar, but generally have thicker bills, more white in the face, and lack a crest. Diet: Mostly fish; also crustaceans, and insects. 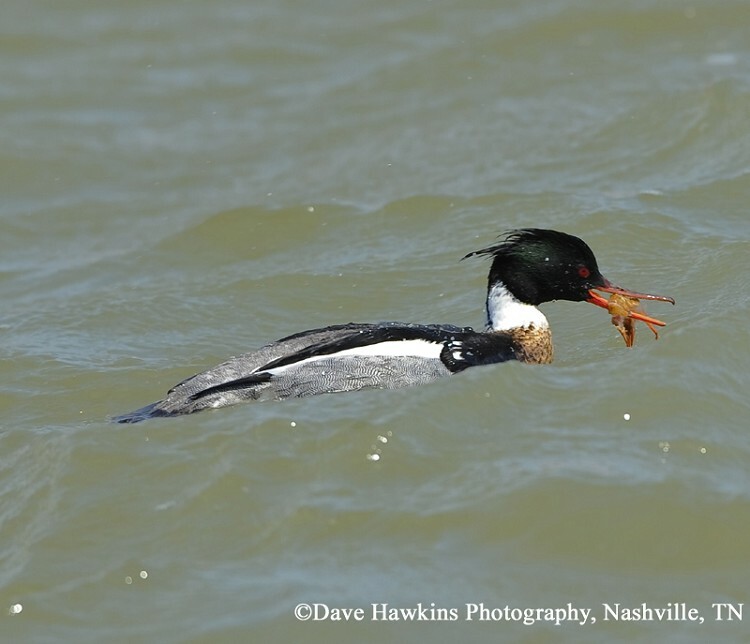 Status in Tennessee: The Red-breasted Merganser is an uncommon migrant and rare winter resident across the state. Individuals arrive by mid-November and depart by early May. Carolus Linnaeus, a Swedish botanist, physician and zoologist, who developed the classification for plants and animals that we use today, first described the Red-breasted Merganser in 1758. Best places to see in Tennessee: Deeper lakes and rivers across the state. Tennessee NWR - Big Sandy Unit is a location that has Red-breasted Mergansers occasionally in winter. Titman, R. D. 1999. Red-breasted Merganser (Mergus serrator). In The Birds of North America, No. 443 (A. Poole and F. Gill, eds.). The Birds of North America, Inc., Philadelphia, PA.